Mirror photo by Gary M. Baranec / A home at 2660 Homers Gap Road in Logan Township was destroyed by fire early Wednesday. A fire official said two people were treated for their injuries after they escaped the flames. 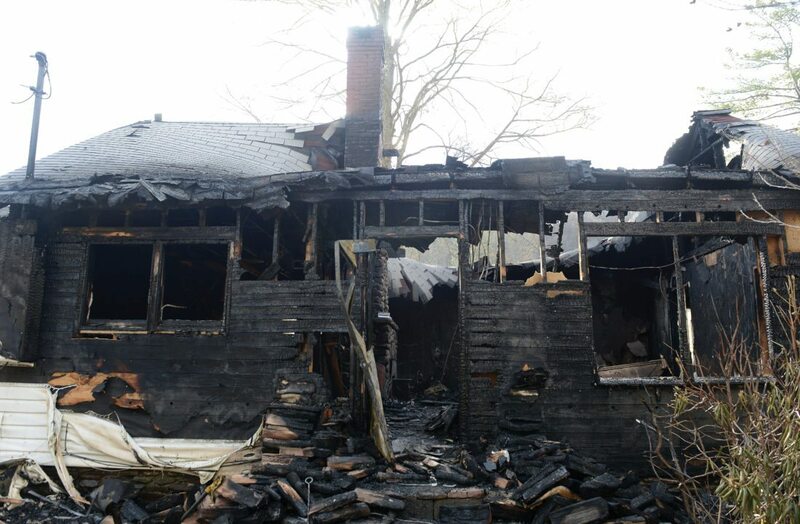 Two people suffered minor injuries after flames broke out at a home on Homers Gap Road early Wednesday. It happened about 4 a.m., and when Logan Township firefighters arrived, they found 30 percent of the single-story house at 2660 Homers Gap already ablaze. “When they got to the scene, there was fire through the roof of the center portion of the house,” said Logan Township United Fire Department Chief Travis Lunglhofer. Lunglhofer said two people — an 18-year-old woman and a 15-year-old boy — escaped after they were alerted to the fire by smoke detectors. They ran to a neighbor’s home, and 911 was called. Both suffered minor injuries while getting out of the burning home and were treated and released from UPMC Altoona, Lunglhofer said. Firefighters from Logan Township, Pinecroft and Bellwood responded and tanker trucks from Allegheny Township and Sinking Valley fire departments were called in, although Lunglhofer noted they were called in as backup since water was readily available from the nearby reservoir and an adjacent creek. The fire was put out in about 15 minutes with firefighters remaining on scene until about 9:30 a.m., and state police fire marshals worked to determine a cause of the blaze. The home is a total loss. The American Red Cross was at the scene to assist the residents.